Why are Jacks called Jacks? Why is the jack called a jack, rather than a prince or earl or another nobleman? In the 15th century, for some reason (unknown), the French card makers substituted a queen instead of the cavalier. French cards became popular in England and formed the basis of the standard English pack. Originally, in England, the court cards were called king, queen and knave, with knave being the now-defunct term for a male servant. Card game books still referred to the knave in the 3rd quarter of the 19th century. In the game of All Fours, jack is the name of the point awarded for winning a trick containing the knave of trumps. It was therefore also applied to the knave of trumps itself in this game [quoted in Cotton's Compleat Gamester of 1674-80]. Later it also meant any of the knaves [ref. Martin's English Dictionary of 1749]. The word jack also had 'a common man' as one of its meanings. When it was felt necessary in the middle of the 19th century to label 2 or 4 corners of each card with an index to indicate its value, the makers naturally picked the first initial of two court cards giving the indices K (for the king), Q (for the queen) and the first 2 initals of knave giving Kn. Obviously this was confusing, so by using an alternative term for a common man which was also associated with the knave card, jack, we end up with court indices being an unambiguous K, Q, J (packs do exist with initials K, Q, Kn but this was a short-lived experiment which presumably didn't sell well). At first jack was considered a lower class term [ref. Dickens's Great Expectations, 1861; Estelle says mockingly of Pip "He calles the knaves, jacks, this boy!"] but it gained acceptance while knave became obsolete. Modern English usage has knave now left with just one of its original meanings—a scoundrel. 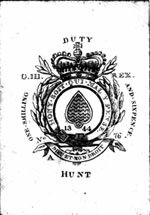 Fake duty ace of spades, c.1815. The duty on playing-cards in Great Britain in the early years of the 19th century became prohibitively expensive, reaching a maximum of two shillings and sixpence per pack. Tax evasion was common and packs were illegally imported from other European countries. The one shown above was probably printed lithographically in Belgium and is masquerading as a British pack printed from woodcut and coloured by stencil in the traditional manner.